Ballquest has been an absolute hoot since we started it earlier in the year. There had been much talk of a “ballcrawl” to further explore the joy of Edinburgh’s hottest balls but busy diaries had made it a logistical challenge. But the day finally dawned so with regular guest questers and #ballquest aficionados Hayley and Jessica on board we set sail to sample some spherical treats. Our first stop was recently opened Ishka on Morrison Street. 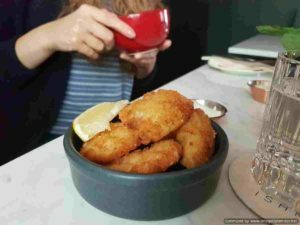 I’d spotted that their bar snacks menu included some likely looking candidates in the shape of their beef shin croquettes and monkfish cheek scampi. We added some of their intriguing sounding cauliflower hummus for good measure (£32.50 for balls and booze). We accompanied things with beers from Stewart’s and a fairly underwhelming julep style cocktail. On a previous visit they’d asked me which rum I preferred in my Martinez. The drinks are clearly not where their strengths reside. The balls were both very good. The accompanying horseradish and tartare sauces were nicely crafted, too. The hummus was also a winner although was perhaps just a little too heavy on the garlic. It was a really enjoyable opener on our adventure. After a quick stop for a beer in the sun in the Akva beer garden, we headed to Harajuku Kitchen. Our sights were set on takoyaki. Harajuku is a fine purveyor of Japanese excellence with a menu that encompasses some really smart dishes. 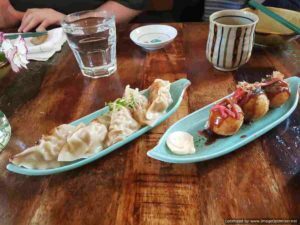 We designated gyoza within the ball scope so ordered their pork variety along with the octopus ball goodness, and a couple of off-piste options in the grilled aubergine and tuna sashimi (£32.15). It was lovely to be able to say hi to chef owner Kaori and congratulate her on recent awards success. Then it was on with the show as the dishes arrived. The takoyaki was as excellent as expected. It was Hayley’s first experience of sashimi and she was a fan. The gyoza were outstanding and the aubergine first rate. We were very happy bunnies. Our last stop on this ballcrawl was pizza favourite Wildman(wood). Having broadened their menu to include a range of sharing dishes, I hadn’t quite appreciated the sheer number of ball options on their list. 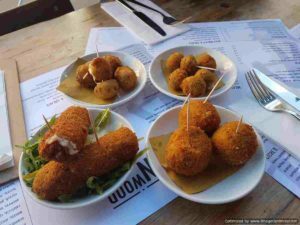 We went deep and ordered the arancini, parmesan croquettes, the goat’s cheese stuffed olives, the deep fried mozzarella, the pork and fennel meatballs and the lamb and mint meatballs (£32.40). These arrived when they were ready as seemed appropriate. 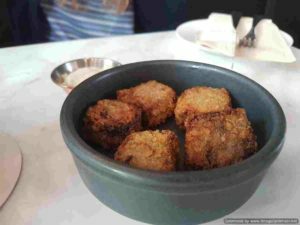 The croquettes aside, these were balls of dinstiction. The stuffed olives were a particular hit with Jessica. I was left in no doubt that this was the broadest selection of balls in our city so well worth a visit for any concerted ball lover. 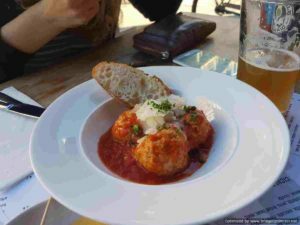 So overall, we had balls to meet all tastes on this inaugural ballcrawl. They made us laugh, cry, and all the other emotes. I look forward to many future attempts to reach #ballquest nirvana.